LAS VEGAS — Manny Pacquiao vowed to show in his first fight since turning 40 last month that he was still a force to be reckoned with in boxing. He is. While he might not be the overwhelming force he was in his electrifying prime, boxing’s only eight-division world champion showed that he was still pretty darn good as he easily rolled past Adrien Broner by unanimous decision Saturday night to retain his secondary welterweight world title for the first time. The 13,025 inside the MGM Grand Garden Arena, where Pacquiao made his American debut 18 years ago, cheered his every move as he delivered a vintage performance in which he showed he is still fast, still skilled and still has some pop in his fists as he rocked Broner several times. In the end, it was a wipeout, though the judges did give Broner some love in scoring the fight 117-111, 116-112 and 116-112. ESPN.com had it a shutout for Pacquiao, 120-108. Pacquiao, a future Hall of Famer and an all-time great, won the 147-pound belt by dominant seventh-round knockout of Lucas Matthysse in July in Kuala Lumpur, Malaysia, his first KO win in nine years. That victory set the stage for his return to the United States for the first time in 26 months to face Broner in what could have served as a warm-up for a rematch with Floyd Mayweather. Pacquiao (61-7-2, 39 KOs), who reunited with longtime trainer Freddie Roach for the fight after a one-fight break for the Matthysse fight, said he wanted Mayweather again. Pacquiao, also a senator in the Philippines, claimed a shoulder injury going into the Mayweather bout hampered him and that he wanted another shot at his rival. What Mayweather (50-0, 27 KOs), who turns 42 next month, saw was that Pacquiao still has considerable hand and foot speed, which he showed from the opening bell. He darted in and out on Broner and landed multiple crisp shots while Broner could barely land anything. 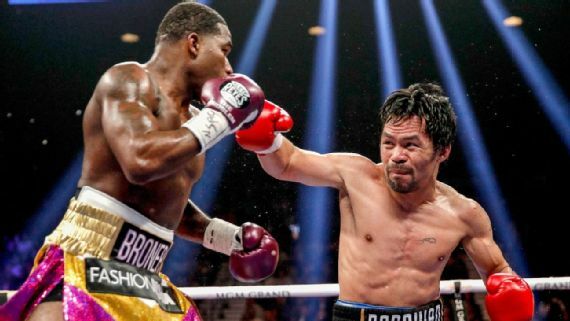 Overall, Pacquiao landed 112 of 568 punches (20 percent), and Broner landed a mere 50 of 295 (17 percent), according to CompuBox statistics. Broner never landed more than eight punches in any round. Yet he climbed the ring ropes when the final bell sounded as though he won the fight and then stunningly said he thought he had, despite the fight not being remotely close. Referee Russell Mora warned Broner (33-4-1, 24 KOs), 29, of Cincinnati, for sticking his elbow across Pacquiao’s face in the second round. Pacquiao later connected with a three-punch combination that forced Broner to the ropes. Pacquiao continually moved forward throwing punches from all angles and all Broner could do was try to tie him up. It was a pro-Pacquiao crowd and there were cheers of “Manny! Manny!” at various times in a fight he thoroughly controlled. Pacquiao landed a hard left to the body early in the sixth round that appeared to hurt Broner, who backed up and tried to shake it off. Pacquiao, a southpaw, went downstairs time and again trying to soften up Broner. Pacquiao had a huge seventh round. He forced Broner to the ropes and unloaded numerous punches that had Broner in big trouble. He escaped, but Pacquiao charged at him to another corner and caught him with another series of clean shots in a two-handed attack that had Mora taking a close look. Pacquiao connected with a left hand with Broner in a corner early in the ninth round and he bent over and grabbed on to Pacquiao’s legs. He just had no answers for anything Pacquiao threw at him. Moments later, Pacquiao connected with a clean left hand that buckled Broner and sent him reeling into the ropes, where Pacquiao continued to pound him as the crowd stood and cheered. By the final few rounds, Broner looked to be in survival mode, more interested in hearing the final bell than trying to win the fight. He landed only one punch in the final round and as he has always done when he has stepped up to face an elite opponent, he lost a decisive decision: Pacquiao, Mikey Garcia, Shawn Porter and Marcos Maidana.